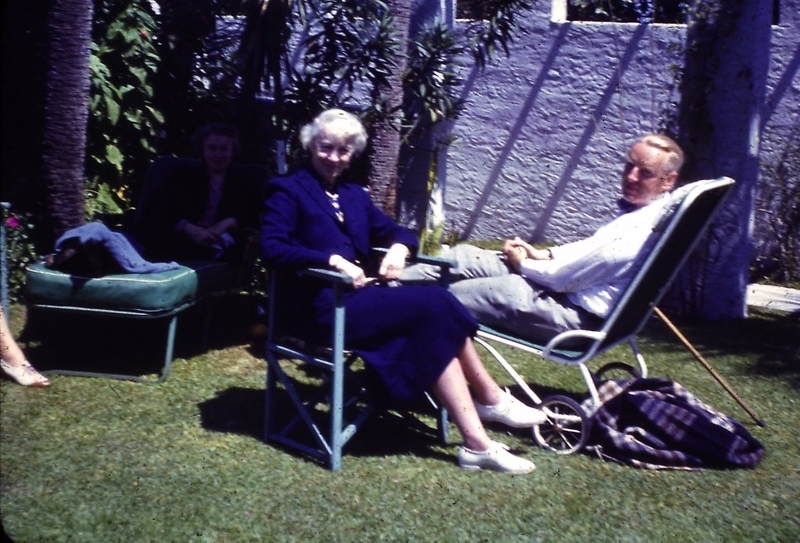 Mary Louise Curtis Bok (1874-1970) with Jules André Smith (1880–1959) in the main garden of the Research Studio (now the Maitland Art Center) in Maitland, Florida, in the 1940s or 1950s. Born in 1874, Bok was the only child of wealthy Philadelphia-based businessman Cyrus H. K. Curtis and Louisa Knapp Curtis, whose Curtis Publishing Company produced two of the most popular magazines in America: The Saturday Evening Post and The Ladies' Home Journal. Bok's early interests included music and writing for the magazine her father founded under the pen name of Mary L. Knapp. Recognized for countless philanthropic pursuits, Mary Louise Curtis Bok provided J. André Smith with sufficient patronage to establish The Research Studio in the early 1930s. As heiress to the Curtis Publishing Company, she is noted for establishing the Curtis Institute of Music in Philadelphia, funding the Annie Russell Theatre at Rollins College in Winter Park, and the construction of Bok Tower Gardens near Lake Wales, along with her husband Edward W. Bok. After Edward Bok’s death in 1930, Mary Louise married Efrem Zimbalist and was thereafter known as Mary Louise Curtis Bok Zimbalist. Born in 1880 to American parents in Hong Kong, raised in New York and Connecticut, and educated at Cornell University, Smith worked for several years as an architect, never giving up on his first love of art. His early passion was printmaking, specifically etching. In 1915, he was awarded a gold medal at the Panama-Pacific Exposition in San Francisco, California. During World War I, Smith continued to work in both drawing and printmaking, selected as one of eight artists by the U.S. government to go to France in 1918 to record military activities. He would later publish those works in a book titled In France with the American Expeditionary Forces. Original color photograph: Maitland Historical Museum, Art & History Museums - Maitland, Maitland, Florida. Viles, Elza Ann. Mary Louise Curtis Bok Zimbalist Founder of the Curtis Institute of Music and Patron of American Arts. 1983. "Mary Louise Curtis Bok: A Portrait of Curtis's Founder." Curtis Library. http://library.curtis.edu/?portfolio=mary-louise-curtis. 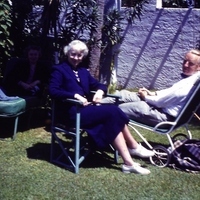 “Mary Louise Curtis Bok and Jules André Smith.” RICHES of Central Florida accessed April 24, 2019, https://richesmi.cah.ucf.edu/omeka/items/show/5339.